Here, Berta, is the email that we were referring to in our comments. On post 1 Berta starts selling “crochetted bears” in 2001, but lies in post 5 that she has been selling them since 1999/2000. This [woman] must have lost a year or two. 😑 She even says in post 4 that she was “well known” for these in 2000, which was before she even started selling them. In post 3 Berta even says that nobody was making these things except for Sue Aucoin. She stated “there was no competition for you,” even though she’s trying to take credit for it. 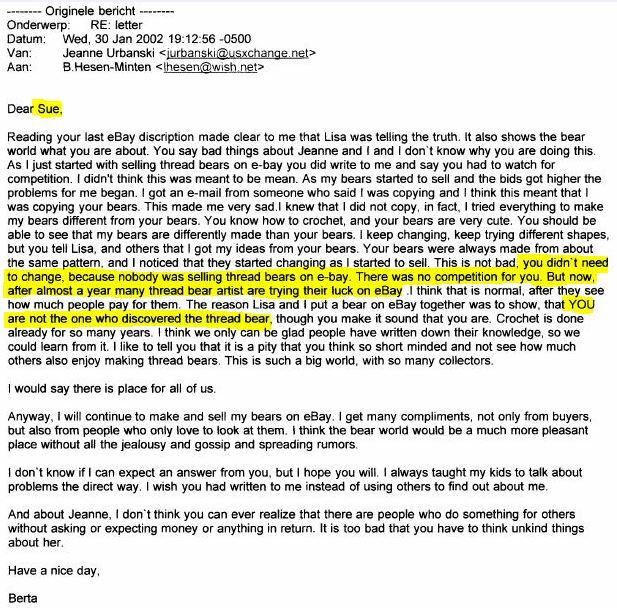 Berta says in post 3 that Sue wasn’t the one who “discovered the thread bear,” but Sue didn’t have any competition and Sue was the one who called these things “thread bears” in post 2, not Berta. 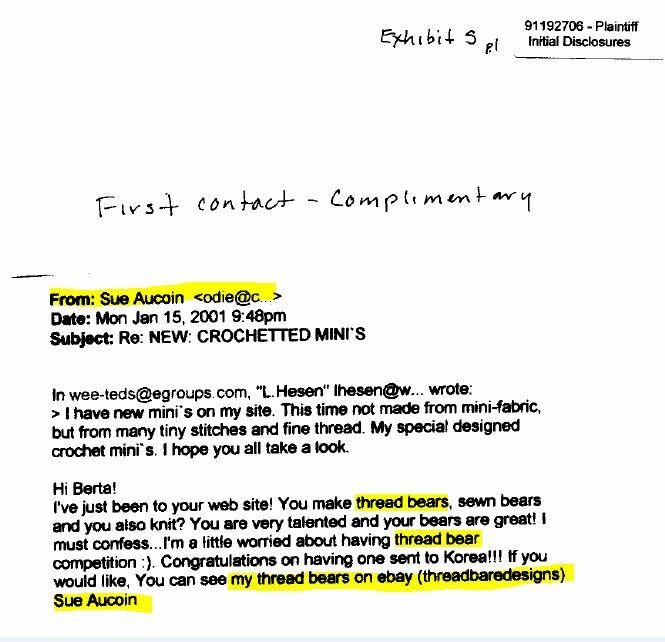 Even Sue’s business name was threadbaredesigns. 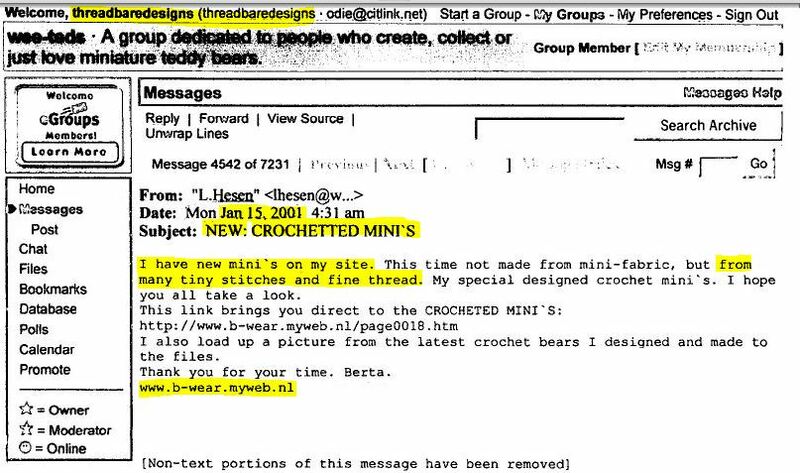 The bear in post 7 has a copyright 2000 date on it with the name “threadteds.” In post 1, with Berta’s first crocheted bear announcement in 2001, it looks like her business was b-wear at that time, not threadteds. Who want to be The First. And to them, that’s the worst. They don’t wanna be the small fry! Doesn’t mean it will be true. You’re bound to step on toes. Has some evidence to disclose. No matter how much you declare. You better believe it will go awry. All images are of public domain. Full credit is given to the author(s). Click on images to enlarge. Post 2: My email response to her announcement. It has been brought to our attention that Berta has lead people to believe that there was more correspondences from me. However, this “complimentary” communication was the only time I contacted her prior to trademark ownership. Email taken from Berta’s evidence at the USPTO exactly as it was submitted, with her hand-written note. Direct links verify to all these public postings are available upon emailed request. I assume you didn`t check for any Copyright notices on the websites you copied from and posted to your Blog? If you had, you would have seen this on my website: All graphics, layout, and photographs of this site are ©copyrighted by Bas Hesen and ThReAdTeDs ®. This site can not be copied in part or whole without written permission from Bas Hesen or ThReAdTeDs ®. Also, I request you remove all the photographs of my bears from your Blog. I can`t remember you asked me for permission to use these. Berta, we checked and you don't own any registered copyrights. Just because you put a copyright symbol on something doesn't mean it's registered. We are not making claim to any of your images or words. We are giving you full credit. And, these are your words as you've written them. Everything we have posted on here is of public domain. Every snippet we have shown has been taken from your public website, from public forums, or from your evidence posted publicly at the USPTO. Therefore, we don't need your permission to post it. It's pretty hypocritical of you to claim copyright infringement when you blatantly infringe on registered trademarks. Besides, you've always wanted to associate your business with ours so much, you should just be happy that your name is on our blog. I don`t infringe on any registered trademark, I am in NO WAY affiliated directly, or in directly with your Thread Bears® company. I am a Teddy Bear Artist who also loves to make thread bears, nothing more, nothing less. Al my writing in your postings about me is true, you make up your own lies. Nowhere in post 1 it says I START selling crochet bears in 2001, As you can read yourself I announce new finished crochet bears, not my first crochet bears. Yes, I became well known since I started selling on eBay in 2000. With eBay it was possible for me to reach more people. I sell my bears since 1999-2000, there are more places to sell bears besides on eBay. I make them even longer. 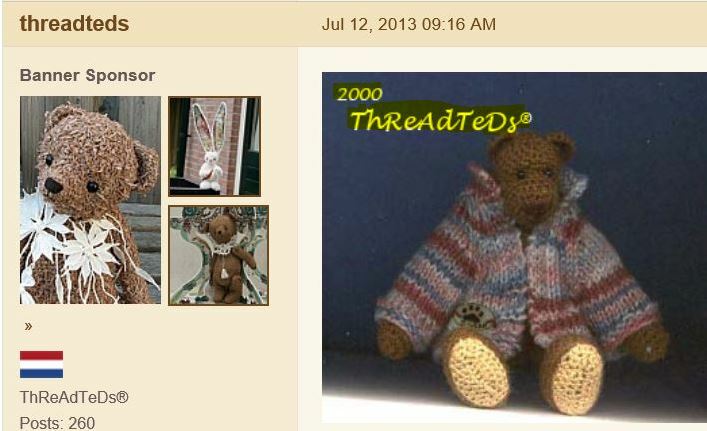 And yes, at first my tradename was Bear-wear, but as you know in 2002 I changed to ThReAdTeDs®. and it has been ThReAdTeDs® since. The picture from my 2000 bear you copied from Teddy Talk. If you would have copied the entire post on Teddy Talk, your readers could have seen that in each pictures the year was added and the trade name I am using now. What is wrong with that?? If that is wrong, then you are wrong too with all the pictures on your website which you made under your multi other trade names for the same product: thread bears. 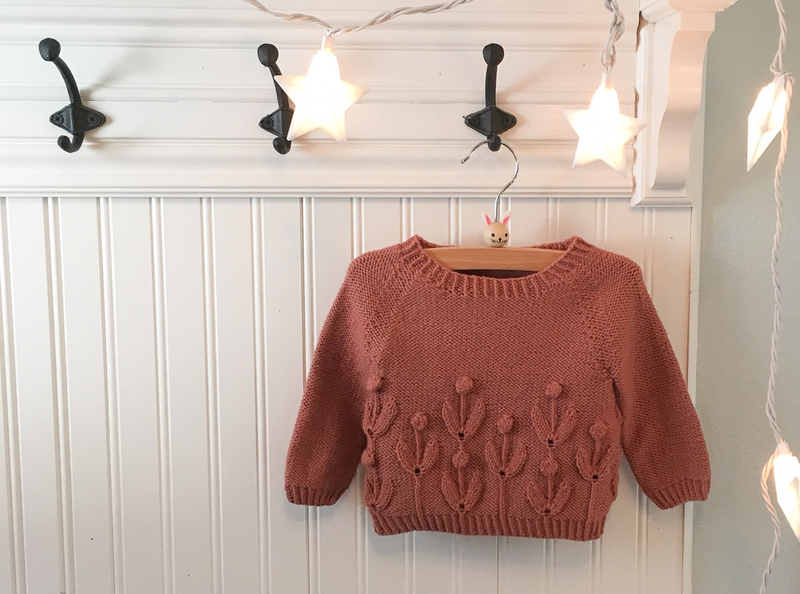 About the accent you give to my wrong writing “crochetted”. Don`t forget, English is not my native language. I would like to see all the mistakes you would make, if you had to write in Dutch !! Berta, we don't make up our own truth. Your words are there, black and white. People have read these for themselves–without our input, without your excuses, without Bobbie's interpretations. You gave this evidence for your first crochet bear publicly. If you want to go ahead and count the past, well then, we've been making these items since the early 80's. But, it doesn't count. What counts is what can be proven–when we first brought these to the public forums/online. And according to you, we were the first, since you said that we had “no competition.” And the only bears you ever advertised before your announcement in post 1 was your sewn ones. And since you bring up the “English is not my native language” subject again… you should know that the participant that gave that answer was merely quoting you. Now, I'm sure that you are going to try to excuse away these lies and blame it on language. But, if your language was good enough to do business internationally, then you know what you were saying back then. You can't lie about it now. People know what you said. This is what you and Bobbie do… you try to make far-fetched excuses to try to make people think they're not seeing what they are seeing. First, if you go after me, leave out my friends!! I am not going to use any excuse for my language, all the above post you used from me are the truth. I didn`t lie then and don`t need to lye about it now. 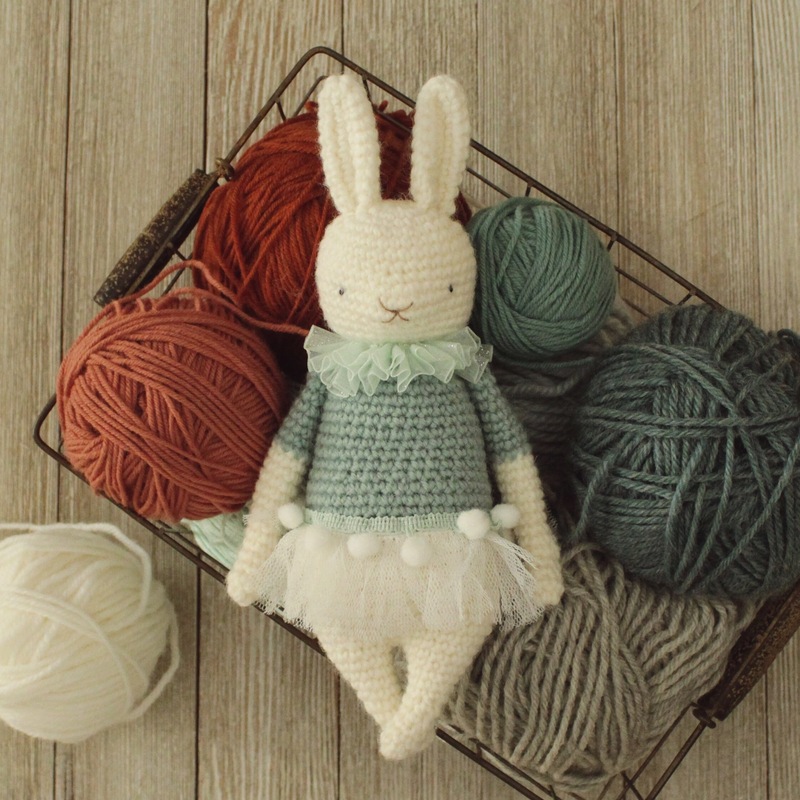 Were do you read in the message that I announce my “first” crochet bears.. I make bears and friends in many different mediums, in that message I only announce NEW crochet bears. This is to silly!! I have other, more important things to do. through the author can rightfully claim copyright. phonorecord for the first time. years after the author’s death. to make a public record of the basic facts of a particular copyright. Other conditions are listed for security of copyrights should they be necessary in court. As stated above, all works in a tangible format are protected under US Copyrights from the moment they are created, registered or not. You have a way of reading (and writing) more into a situation than actually exists, thereby leading to conclusions that are totally false. As you have gathered and saved everything you could find over the past 13 years having to do with those who oppose you, please do realize that there are many many others who also have your innumerable emails, web postings, government postings, etc which contradict each other to no end. But unlike you, we/they are both too polite and too busy to spend so many hours of so many days on a personal vendetta like this. There could be many more postings made on many sites showing the twisted inaccuracies you've made and told to suit your purposes at the time of each writing. Have you never noticed this, when there is a problem like this on a forum somewhere? Not counting Mary, who is voice/channel from you – it's funny how there is your side… and then everyone else. Not one of your supporters ever come out to reinforce or corroborate what you write. Plenty read because it's like those who subconsciously slow down while driving past an auto accident. Example: Have you ever explained the 'Barbara' email and your husband Rick's involvement – 'youre'? Bobbie, one important thing you are missing is that your comments are not considered “works.” A work is something that you create. And, as stated before, we are not taking credit for any of Berta's pictures. The credit is all hers. If you had cleaned up your mess and told everyone that you really misunderstood the law in regards to trademarks (and apparently, copyrights) then it wouldn't have gone this far. And since you have stepped out to stand up for your Berta, as you always do, we have to ask…why doesn't she do that for you or any of her other friends? Why did she stand by, constantly monitoring our blog yet saying nothing while you were the focus on here for so long? And we are not the only ones who have noticed that Berta only defends herself. Also, as stated before–and, as shown in our prelude–we do not think of new ways to keep our trademark before the public's eyes, as you say. You, Berta, and your friends do that for us. Again, you twist my words and give it the meaning it suits you, I didn`t agree to what you are posting is true, I wrote: all the above post you used from me are the truth. I didn`t lie then and don`t need to lie about it now”. Another example how you turn and twist everything and everyone's wordings as it suits YOU. I keep thread bears alive, without all that silly words written in between the words “thread” and “bear”, as you want everyone to do! I keep thread bears a live because I love making them as so many others do. I keep thread bears a live, as that is what they are !! Yes, Berta, you are the one keeping this whole thing alive with your continuous infringement of our trademark. Just because you use it lowercase and call your items “thread bears,” doesn't mean that's what they are. And just because you continue to tell that lie doesn't make it so. And do you need to be reminded that we called them that, not you. “Thread Bears” is our company name. Crocheted bears is what you make. You know this. And do you not recall when you stated this in your last submission at the Trademark Office: “Opposer will follow the judgement of the Judges of this Appeal Board…” And do you not recall that we won “Thread Bears” and “Thread Teds by Thread Bears” registrations? We won, so why don't you move on? 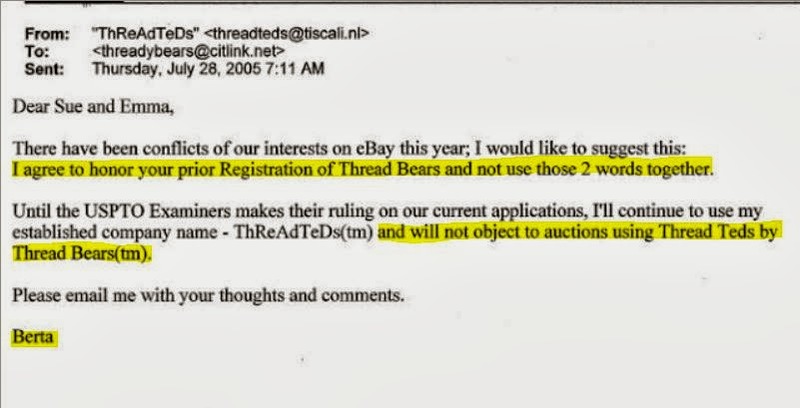 “There have been conflicts of our interests on eBay this year; I would like to suggest this: I agree to honor your prior registration of Thread Bears and not use those 2 words together. We've included the snippet of this email at the top of this section for you to verify your words. IF YOU WOULD QUIT USING OUR TRADEMARK, AND IF YOU AND YOUR FRIENDS WOULD QUIT ENCOURAGING OTHERS TO MISUSE OUR TRADEMARK, THIS WHOLE THING WOULD BE OVER. Again, I don`t use your trademark, I never pretend to be you or Thread Bears® company, I use thread bears in the descriptive way, which is allowed by the law. Again, READ your own disclaimer!! 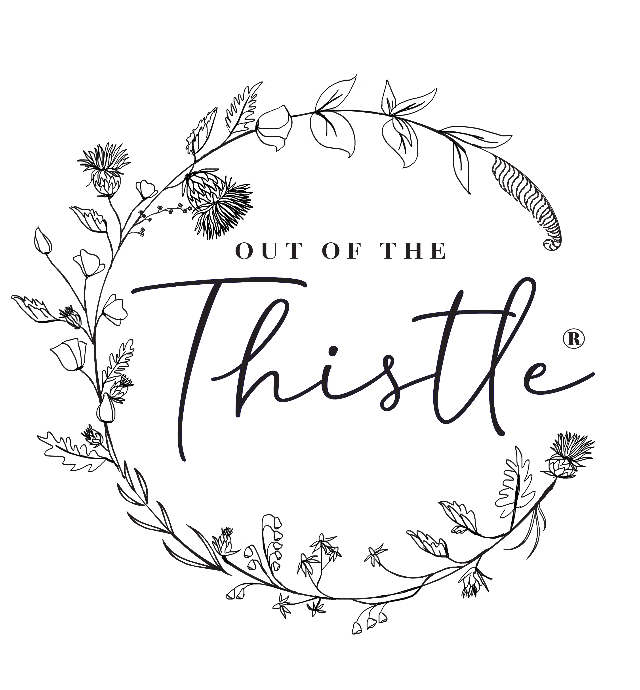 If you had not had applied for a trademark, with my business name incorporated, which you knew was in use since 2002 (registered or not, that is the same, the actual use of a mark/brand counts), if you would have been tolerant to your “competition” ( Your word, not mine,I call mine fellow Artist), and not had started to remove everyone from public sale pages who was making and using the words thread bears (at that time already in use for many years), this whole thing would not even have started! !